You have to believe me... 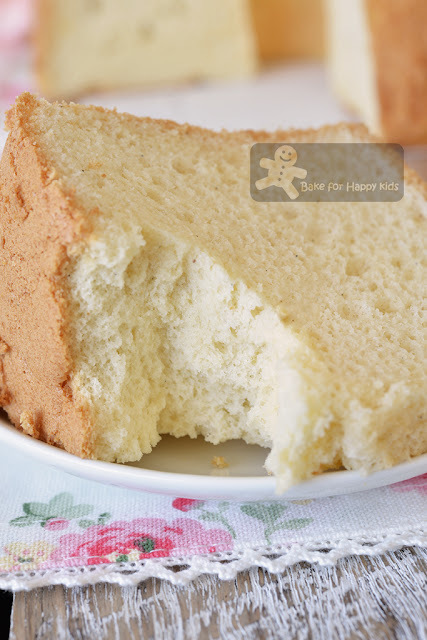 Creating recipes that bake ultra soft chiffon cakes is not so easy!!! After deriving these ultra soft chiffon cakes at here (banana chiffon cake), here (honey chiffon cake), here (cranberry yogurt chiffon cake) and here (cocoa chocolate chiffon cake), I have been going through a tough journey just to bake a basic milk chiffon cake that is ultra soft enough *Ahem* to pass my very strict cake standard!!! You have to believe me... I have gone SO mad, crazy and all out just to optimise an ultra soft milk chiffon cake recipe! And finally, I did it!!! As seen at here (banana chiffon cake), here (honey chiffon cake), here (cranberry yogurt chiffon cake) and here (cocoa chocolate chiffon cake), I have this ultra soft chiffon cake belief that the chiffon cakes that are baked with NO cream of tartar, baking powder or any cake raising agents are actually the BEST being the most moist, tender and cottony soft!!! To me, although the addition of cream of tartar and baking powder will make chiffon cakes looking tall, fluffy, impressive, structurally stable and easier to bake and handle, these cake-rising ingredients tend to make the cakes structurally stiffer and kill their ultimate softness! Agree? You probably think I'm a cake cuckoo... LOL! Then, how do I derive my ultra soft chiffon cake recipes? I've been totally obsessed with chiffon cake recipes and do have a few theories and guidelines to create my ultra soft chiffon cake recipes. Along with my theories, I did lots of trial-and-error baking to fine-tune my creations. Many readers have asked me if they can substitute this with that or that with this to make the chiffon cake that they want. Hmmm... Not really! Some ingredients can be very different causing some modifications to be not so straightforward and easy! So what are my theories? Here you go... but you know what? I might be wrong sometimes!!! LOL! To me, every recipe that I created HAS to be well tested and tasted before I can safely say... Yes! This is the approved cake! And I hope that you can understand this will take a lot of my time!!! Due to the absence of cake-rising ingredients, I prefer to use more egg whites than yolks to maximise the raising of the cake but sometimes, adding too much egg whites can toughen some cake texture too. More liquid ingredients and less flour added in a cake means that the cake will be moister. Agree? Yes and no because the chiffon cake with excessive amount of liquid might turn out to be unstable with extremely large bubbles or go the opposite way being not risen well resulting the cake to be dense or even tougher than usual. This is baking 101! Using cake flour or adding cornflour will reduce the gluten content of the cake making it more tender and softer in texture. More egg whites. More liquid. Less yolks. Less flour. Less gluten. You can imagine that the chiffon cakes that are made with the extremes of these theories will make the cakes very structurally unstable resulting them to rise well to an extended height but will shrink or even collapse after cooling. Hence, I'm after a cut off point to apply these theories, hoping to derive a chiffon cake with the maximal egg whites and liquid used, plus the minimal yolks, flour and gluten required. First, I tried to incorporate 125g milk with 90g yolks and 240g egg whites into one 20 cm chiffon cake and the cake was so unstable that it broke apart when it was removed from the cake pan. Bummer! Then, I reduced 125g milk to 100g and baked it with 90g yolks and 240g egg whites but the holes in the cake are way too big for my liking. This milk chiffon cake is awesome when it is baked with equal number of egg yolk and whites. Gosh! See the cake! It looks so soft and beautiful! Being extra fussy, I still think this chiffon cake recipe needs a little more fine-tuning as I reckon that the cake has been over-loaded in one 20cm chiffon pan. It was rising a little too rapidly and shrank a little too much. And so I reduced the recipe proportionally and baked this proportionally perfect-looking cake! FINALLY!!! 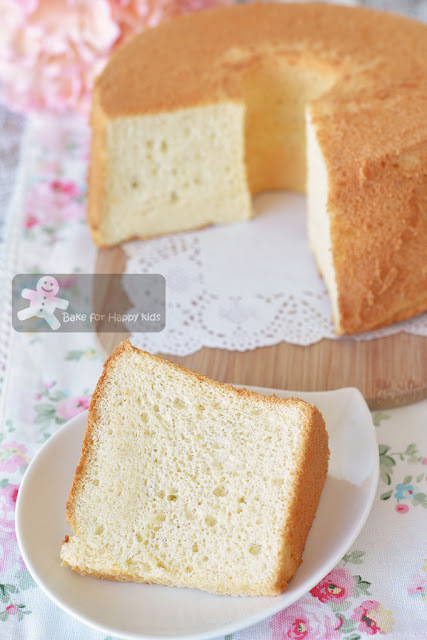 I have baked a milk chiffon cake that is so moist and cottony! Any baking tips? As always, I do. 1) Being part of my obsession of creating the best chiffon cakes, I have discovered a peculiar way to beat my egg white mixture. Using an electric mixer with a whisk attachment, first is to beat egg whites in the lowest speed for at least 10 mins to stabilise the mixture. Then, increase beating speed to next higher speed and while beating, add sugar gradually. After all of the sugar has been added, increase beating speed to the next higher speed and continue to beat until stiff peaks form and the meringue should be smooth with very tiny bubbles. And I reckon this way of beating egg whites for chiffon cake is always working very well for me all the time!!! So remember... Never beat the egg whites with too high speed and never over-beat the egg white mixture!!! 2) You need at least 100g sugar to beat the egg white mixture into its best form. Please do not reduce this amount of sugar added. 3) With the maximal amount of milk added, this cake will rise rapidly during baking and will shrink a lot more after cooling. For this reason, I prefer to bake the cake in a slightly lower oven temperature at 160°C and baked it a little longer for at least 50 mins. Having said that, different ovens can be different and I know that my current Ariston oven is typically warmer than some ovens. Thus, if you think that your oven is not strongly heated like mine, you might want to bake yours at 170°C which is has always been the standard temperature to bake all chiffon cakes. 4) Like all ultra soft chiffon cakes, this very fragile and cottony soft and moist chiffon cake needs to be handled with tender loving care! Please do not unmould the cake by pressing it!!! To unmould, please use a blunt thin plastic spatula or knife to run along the cake's edges and gently push the cake out from the pan. Plus, please use a serrated knife to slice the cake. 6) Last but not least, please use the exact weight of the ingredients and make sure that all ingredients are at room temperature. 7) Update on 5/10/2017: One more thing to say... It's ok to have some cracks on this cake!!! Please do not bake this cake with too low oven temperature or a tray of boiling water. Detailed explanation is at here. Gosh! At this point, I think it is enough for you from me... Too much blah blah blah!!! LOL! Told ya that I have gone SO crazy baking these chiffon cakes. 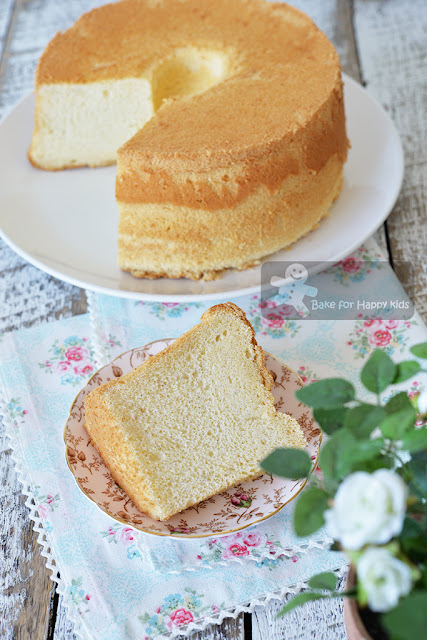 So, here's a quick video showing how I baked this ultra soft milk chiffon cake. Using a hand whisk, whisk egg yolks and oil in a large mixing bowl until mixture is combined and turns slightly pale. Then, whisk in milk and vanilla until combined. Sift in flour and salt and whisk gently until the batter is smooth and combined. Pour batter into an un-greased 20 cm chiffon tube pan. Give the pan a gentle tap and use a skewer to draw a zigzag on the batter surface to remove any large air bubbles. Bake at 160°C for 55 mins or until it is thoroughly baked. IMPORTANT: This cake has to be baked for at least 50 mins in total. After baking, drop the cake from a 20-30 cm height immediately onto your tabletop to minimise shrinkage. Then, invert the cake immediately to cool on a wire rack. Allow the cake to cool completely in the pan before removing it from the pan. Important: Do not unmould the cake by pressing it! To unmould, please use a blunt thin plastic spatula or knife to run along the cake's edges and gently push the cake out from the pan.The cake is fragile and so it is easier to slice with a serrated knife. Enjoy! Zoe I can see how soft your milk chiffon cake is. Will try it! Hi, thanks for kindly sharing your knowledge with us. I'm mad after cakes now, similar wyou. May I ask you a question that which cake mould did you use? I mean non-stick one? Or any other metal one? My friend uses a clear glass bowl. What's best as per your expertise? 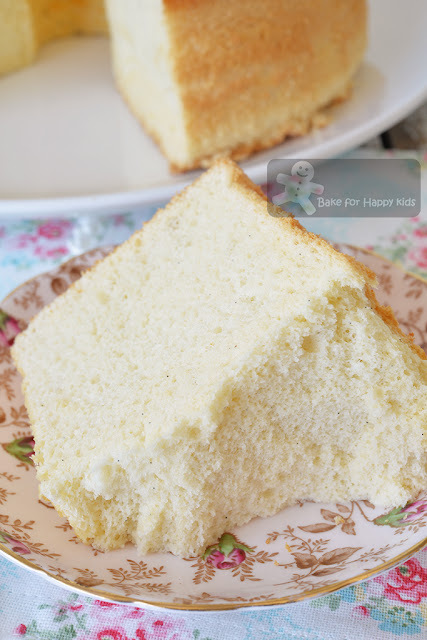 Hi Sha, please use chiffon (tube) cake pan with NO non-stick surface to bake this recipe. No glass bowl please! I have tried few of your chifforn cake recipes and they really taste gd and soft.. Hope u can come up with more different varieties of chifforn cake recipes.. Jia You !! Hi Zoe, tried this recipe it really taste soft and good! Hi Zoe, for coffee chiffon, is it to mix instant coffee with the same amount of milk? Thanks. Hi Belle, you can dissolve 15g coffee granules with 10g hot boiling water. Set aside to cool slightly. Add 90g milk (instead of 100g) into coffee mixture and mix well to combine. Cheers! Hi, I am using a convection fan oven (khind ot52r), may I know the temperature and time still the same? Many thanks! Hi Phoon, different oven are different in their oven settings and I'm not too sure about your khind oven... whether it is stronger with its heating or not. Best is to read the manual and try baking the cakes with a couple of trial and errors. Cheers! Can you do tofu chiffon plz? I love your recipe. Thanks for your suggestion. No promise but I will see if I can make time to optimize and bake this chiffon cake in the near future. Hi Grismy, I have replied via FB. Cheers! Hi Huimei, I'm sorry but please see my baking tip no 5. Cheers! Thanks for showing your interest to bake with this recipe. Please refer my baking tip 5 for your question. So sorry that I don't do calculation for everybody. Cheers! Hi Zoe! This is the first time I try to bake chiffon cake, and your recipe works wonders!! Of all the cakes I try to makes, only this turns out so fluffy and light in taste. My hubby never liked eating cakes, but this one is an exception. Thanks a lot Zoe! Hi Zoe, I just made this last night and it turned out divine! My hubby and my 2y5m daughter kept asking for more! It's actually my very first attempt in baking a cake actually, and I'm so glad to have challenged myself with this recipe :) Thanks for the inspiration and great recipe, I'm motivated to try out even more types of bakes now! Hi,Ms.Zoe!Thank you so much for sharing your recipe.I just made coffee chiffon cake and it was a success!I tried many recipes before,but your recipe is the best. Hi Rowena, Happy to hear that you like my recipes :) Happy Baking! Hi, Zoe. I have never attempted to bake a cake before, and was terrified by everyone around me saying chiffon cakes require skilled hands. Nevertheless, I went ahead to purchase the necessary ingredients and followed your instructions to a tee. Speaking of tea, your recipe helped me make the fluffiest, most moist and lightest cake I could ever dream possible, and it has complemented a nice cuppa afternoon tea very well. Thank you so much for tweaking this recipe till it was perfected!